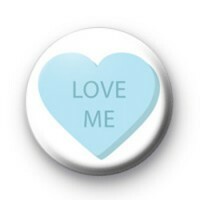 Blue and white Candy Heart Style 1-inch Button Badge. This romantic white badge has a big blue heart and the text, Love Me in the centre. It is a lovely badge to use in your own Valentines Crafts or to give to your boyfriend, girlfriend on Valentines Day.